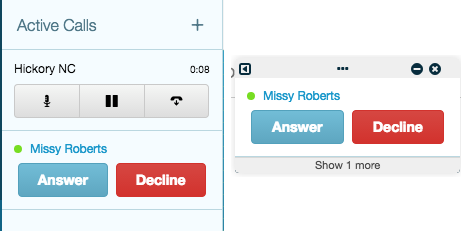 An incoming call appears as a message that includes the incoming caller’s avatar and name (when available). If the call is from someone who has called a group that you are a member of, the group’s name also displays in the message. You can view any past calls in the Call History tab in the Calls panel. Note: When you select certain statuses, such as Busy, you do not see alerts and all of your incoming calls go directly to voicemail. For more information about the types of presence and status, see Presence, status, and activity indicators. If you receive an incoming call while on a call, you see the call either in the mini call controls pop-up or in the Active Calls list if you have the calls panel open. To answer the incoming call, select Answer. The original call goes on hold and connects you to the new call.